Can't say for certain that this turquoise was mined from the Sleeping Beauty Mountain in Globe, Arizona. 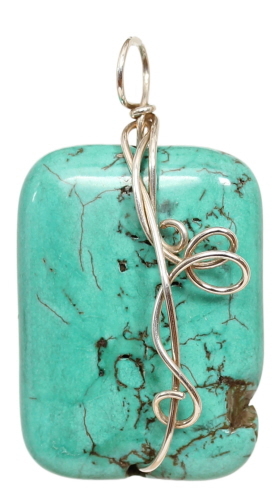 Natural turquoise is stabilized for hardness and durability. Frequently dyed to enhance the warm tones of blue-green. This bead is cut into a rectangular shape and measures 34 mm x 25 mm. Wrapped in argentium sterling silver wire. Finished size is 44 mm x 26 mm. Weight is 0.5 oz. It is said that turquoise can warn the wearer of danger or illness.